A Nixon scholar compares the early days of Trump’s presidency with Nixon’s. A little-known pre-Watergate Nixon scandal helps us understand the road the new president’s traveling. Photo illustration by Slate. Photos via Bettmann, Win McNamee/Getty Images. Firing an acting attorney general, threatening widespread investigations against civil servants, characterizing unfriendly press as enemies of the state. And with the possibility of collusion with a foreign power inspiring suspicions of a cover-up involving a sitting president, is it any wonder that nearly 45 years later, we have Richard Nixon on the mind? For a generation whose context for understanding presidential misdeeds is the Watergate scandal, it’s worth asking: How Nixonian is the Donald Trump administration so far? For a time, Trump might not have minded the comparison; he so admires aspects of the disgraced 37th president that he proudly displays in the Oval Office a framed letter in which Nixon prophesied a future political career for the Manhattan developer. There are some important differences in the men themselves. Richard Nixon was an introvert, and Trump, though he does seem to like being alone, is more the extrovert. Even more importantly, Nixon was a skilled lawyer and had legislative and executive experience at the federal level before taking the oath of office. Although he did not like Washington much more than Donald Trump does, Nixon, at least, understood it. Both Trump and Nixon share a boredom with policy details. Nixon came to office without any real domestic agenda, and he made clear that he wasn’t that interested in the details of what his team did. Instead he would issue angry and categorical in-house declarations, leaving the follow-through to others. (White House Chief of Staff H.R. Haldeman noted in June 1969, “P[resident] has decided against [racial] integration”; “will do very minimum the law allows.” It was up to the staff to determine how to fulfill that order.) Both men are consumed by consideration of their own image. Nixon, who was not a particularly hard worker and lacked a sense of humor, urged his staff to leak information that would paint him as a witty workaholic. And finally, both men share a sense of victimhood, which blends into a sense of being encircled by adversarial conspiracies. These men imagine and feed off the existence of armies of clever, often unnamed, enemies. Remarkably, given that each rose to become commander in chief of the richest, most powerful country in the world, they act as if they have routinely been slighted. Whether it is by American Jews (in Nixon’s case) or foreigners (in Trump’s case) or the faceless American establishment and the media (for both of them), these men nurture grievances which for Nixon would prove fatal to presidential success. And for Trump? Any effort to tease out whether the Trump administration is likely to produce the same outcome requires understanding what made Nixon’s administration Nixonian. In other words, where does the Trump administration currently stand on the Nixonometer? In many ways, their presidencies started very differently, reflecting the differences between the men. Although he didn’t trust them, Nixon was prepared to hire members of the American and university establishment—Harvard professors, Brahmins, and even Jewish Americans—for the sake of his administration’s reputation, and because he had a sense of what smart government looked like. Trump seems to lack any basic understanding or belief in public administration, and many of his high-level picks mirror that prejudice. There was a sense of orderliness, a surface calm, to the early Nixon administration. It would take more than three years for the press to find the dark currents under the surface that would ultimately scuttle the entire enterprise. The Trump administration has been chaotic, combative, and temperamental from the start, displaying a level of visible defensiveness and incompetence the Nixon administration wouldn’t attain for a few years. 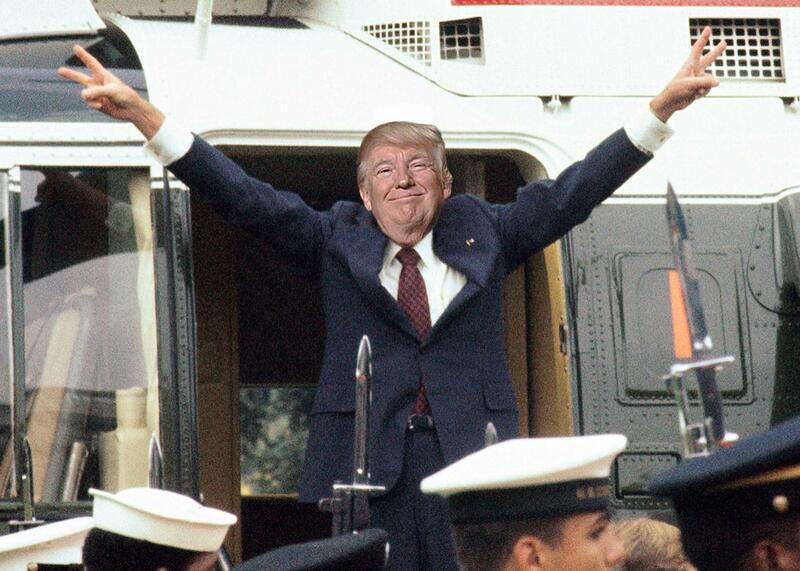 The temptation, for those watching aghast at the opening months of the Trump administration, is to compare the events with those final few years of Nixon’s presidency. But the better parallel, at least at this point, might be with Nixon’s actions in his 1968 presidential campaign, and immediately after—a narrative that was little known at the time, but which rhymes neatly with the growing questions about contacts between the Trump campaign and Russians in 2016. Thanks in great measure to the dogged research of Nixon scholars John A. Farrell and Ken Hughes, we now know a lot more about Nixon’s activities in 1968 than the press or the public knew at the time. Fearing that the election—which he had been leading most of the summer—was slipping away, Nixon ordered his team to “monkey wrench” Lyndon Johnson’s efforts to get the warring sides in the Vietnam conflict to the peace table. The exact mechanics of how he stage-managed this intervention in U.S. foreign policy are still not fully known. But a surrogate for his campaign, Anna Chennault, repeatedly met at Nixon’s suggestion with the South Vietnamese ambassador to convince Saigon to resist Johnson’s entreaties to turn up at the negotiating table in Paris. She reported to John Mitchell, Nixon’s campaign manager. As polls showed the race tightening to a horse race, Chennault repeated her vow that the South Vietnamese would get a better deal if Nixon won, insinuating that she was speaking on behalf of her “boss.” Chennault’s efforts did not go unnoticed. Not by the South Vietnamese, who helped the Nixon campaign by refusing to go to Paris, and not by U.S. intelligence, which put her under surveillance and undertook electronic coverage of the South Vietnamese Embassy. The Russian hacking scandal has the potential to be the Chennault Affair of our times. In both cases a foreign power made a decision that influenced—but arguably did not determine—the outcome of an election. The difference is that the declassified record about 2016 so far does not indicate any collusion between the Trump campaign and the activities of the Russian Federation. But Trump’s comments during the campaign and his tweet-allegation of Obama wiretapping in recent days are reminiscent of Nixon’s over-the-top denials to Johnson that he had anything to do with the South Vietnamese reticence to negotiate and his later public criticism of his predecessor. On Nov. 3, 1968, Nixon told Johnson in a private conversation (that LBJ taped! ), “My God, I would never do anything to encourage Hanoi—I mean Saigon—not to come to the table … Good God, we want them over in Paris.” He didn’t. After he became president, Nixon—convinced that Johnson had been conspiring against him—spread reports alleging that Johnson had tapped his campaign plane. Nixon knew this wasn’t true—he had access to the intelligence records from 1968—but saying your predecessor was spying on you can make a compelling story, especially when you have something to hide yourself. Only years later, as Watergate took hold, did the press get a sniff of the Chennault Affair. In 2016, the press is uncovering new Russian connections daily—in part because Trump’s White House, unlike Nixon’s in its first months, leaks like a sieve. Does that mean that Trump is on his way to his own Watergate? Not necessarily—not because Trump isn’t more than a little Nixonian, but because many of us have forgotten just how dark and devious Nixon himself could be. Before we can begin to assess Trump, we need to revisit the historical Nixon of the Watergate catastrophe. There were, to be sure, abuses early in the administration. In addition to the Chennault Affair, there was the use of the secret service to spy on the president’s brother; the hiring of an outside contractor to spy on an American journalist, Joseph Kraft; taking a huge illegal tax deduction by backdating a document; and the decision to use federal funds to pay for embellishments to Nixon’s vacation homes. But these were petty crimes compared to what would happen later. By 1971, the pressures of the White House—the failure of his Vietnam policy, the growing opposition outside, and Nixon’s sense that he could not turn the Washington bureaucracy to do his bidding—radicalized the president. That was the year Nixon would order the creation of an illegal White House investigative unit (the “Plumbers”), which spied on Americans, committed breaking and entering, and worked to ruin the reputation of a whistleblower named Daniel Ellsberg. The long, conspiratorial summer of 1971 also brought a presidential order to turn the Internal Revenue Service against Vietnam War dissenters in the American elite (the “enemies list”), a presidential order to enumerate Jews in “sensitive areas” of government and remove those who calculated the official unemployment rate, and a decision to use the FBI to discredit the journalist Daniel Schorr. * And if all of this were not bad enough, that year Nixon was caught on tape approving the hiring of Teamster “thugs” to break bones and smash noses at Vietnam protest rallies. Not only did Nixon fantasize about swarms of enemies, but he sought to use federal power to hurt them. Brutal. The abuses of 1972 became even better known. After the Nixon White House approved the formation of a political espionage team headed by the infamous G. Gordon Liddy, the 1972 re-election campaign had its own breaking-and-entering squad, caught red-handed by local cops in the office of the Democratic National Headquarters in June after a series of other attempted and successful crimes. So far there is no evidence that the Trump administration has done or even contemplated doing anything felonious. This is by itself not an exoneration of the dramatic overture of the 45th presidency; it is simply a recognition of how very dark the Nixon experience was for this country and the care with which we should throw around the Watergate analogy. It was more than a mere cover-up. There may yet be hope that Trump will not sink to Nixon’s depths. (Or, depending on your perspective, there may be reason to despair that Trump will never suffer Nixon’s fate.) Nothing much about the Chennault affair leaked until several years later—so perhaps Nixon thought he had gotten away with gaining political advantage through covert action, which led him to behave more and more recklessly. So far, the Russia matter is playing out in front of us in a manner that the Chennault scandal did not—in part because Trump, unlike Nixon, has so incompetently handled his presidency’s opening act, has managed to alienate the federal bureaucracy much faster than Nixon, and seems to lack the self-restraint to be effectively sneaky. With the eye of the press, the bureaucracy, and the public so firmly upon him, Trump may find any desire he might have to engage in presidential dirty tricks to hurt his perceived enemies thwarted before the fact. Perhaps Donald Trump, the only president in recent memory less temperamentally suited to the office than Richard Nixon, has inadvertently placed a limit on just how Nixonian his administration could become. He could still do a lot of harm, but it would not then be Nixonian; it would be Trumpian. We shall see.